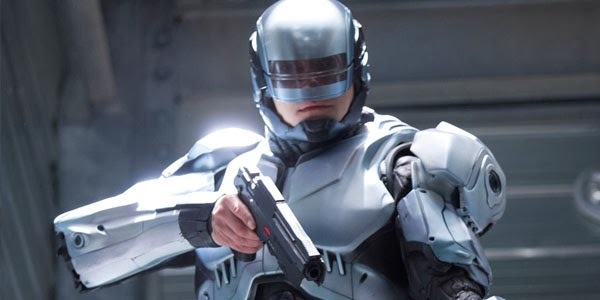 The remake of the original 1987 Robocop has been in the works since 2005. Brazilian director José Padilha signed on in 2011. The screenplay by Joshua Zeturner is based on the characters created by Edward Neumeier and Michael Miner. There is still the Detroit Police Department, there is still OmniCorp which make robots for enforcement and there are still the bad guys that Murphy must exact revenge for his murder. The film was supposed to be released in August 2013, but has since changed to open right before Valentine's Day. A nice balance to the overload of romantic movies that will open this weekend. The movie opens like the first film with a TV show, only this time it's commentator Pat Novak (Samuel L. Jackson) who like out present day FOX network offers his obviously slanted opinions on the use of robots in other countries. Novak is staunch opponent of the Dreyfuss Act which restricts the use of robots to uphold the law as it's method doesn't allow for an emotional element when dealing with humans. OmniCorp CEO Raymond Sellars assigns their chief scientist Dr. Dennett Norton (Gary Oldman) to use his skills with robotic prosthetics to create Robocop. Alex Murphy (Joel Kinnaman) a Detroit police detective and his partner Jack Lewis (Michael K. Willimans) are investigating missing weapons from the police evidence room. Lewis is badly injured and Alex is horrendously burned and maimed when his car blows up. His wife Clara (Abbie Cornish), wanting to save his life no matter what, signs the papers for OmniCorp to use Murphy in their project. Murphy is outfitted with the Robocop body and software which enhances his strength and tactical skills. His brain can access and instantly compute data that helps him locate criminals. His human side helps him relate to the public. It seems the program is a success until a glitch is discovered. Dr. Norton has to alter his brain chemistry to keep him focused. Unfortunately he no longer recognizes his wife, son and his best friend. He becomes more of a robot. Like in the first movie, Murphy manages to rewrite his programming and continue with the mission that spurred his meltdown. He wants to solve his own murder. He almost closes the case when OmniCorp's military tactician Mattox (Jackie Earle Haley) pulls the plug. Although there's a lot of violence in the movie, it's more of the computer game type of visuals as we get a P.O.V look through Robocop's eyes. He's quick and efficient taking down the bad guys in record time. The movie is rated PG which means it's not graphically blood dripping. Robocop is taken apart and put back together like Ironman, only Ironman mechanics is a suit, while Robocop is assembled parts. The only human pieces are his face, brain (with computer chips), lungs and one hand. The Paul Verhoeven version was a more subversive film on corporate corruption, greed and privatization. Even the smiling TV newscasters in their now dated 80's style played on the satirical dumbing down of our society. While the 2014 film looks good, it seems to lack a bigger picture that the first one addressed. It's a lot better than expected, but it's a bit paint by numbers action film.